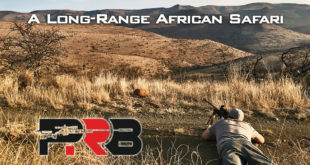 This post summarizes the results for the recoil tests ran on 20+ muzzle brakes using two 30 caliber test rifles: the 308 Win and the monster 300 Norma Magnum. The recoil data was collected using high-speed, high-resolution force sensors. For more info on the test equipment and how the data was gathered, please see the recoil post. 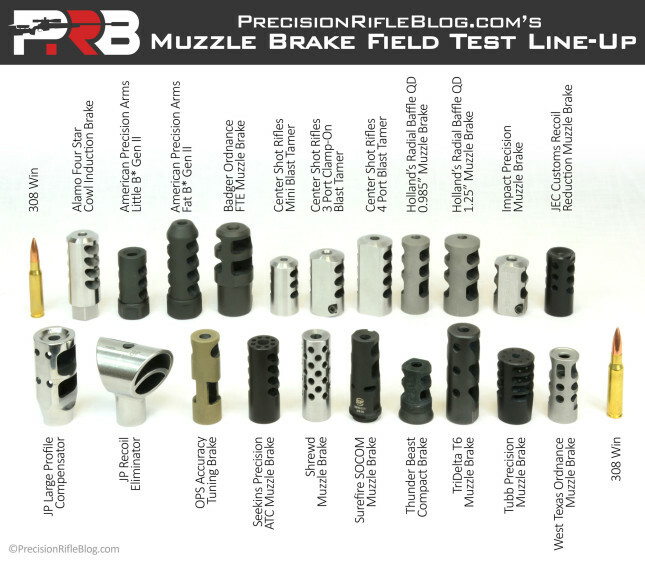 Here is the full line-up of muzzle brakes, and you can read more about each in this post. As we discussed in the recoil post, when someone claims a product “reduces recoil by 50%” … it usually isn’t clear what they’re talking about. Unfortunately, there is no industry standard for measuring recoil, which means manufacturers often publish whatever makes them look better. The big question comes down to what measurement most closely correlates to perceived recoil from the shooter’s perspective. Some experts lean more towards that being related to the total impulse or momentum, and others think it is more linked to the peak force. As we learned in the recoil post, it seems to be some combination of the two factors. Honestly, I’m not here to try to convince anyone one way or the other, but simply present the data. % Reduction in Overall Momentum – This is the reduction in overall impulse or total momentum of the rifle at the end of the recoil. It represents the total “size” of the force that I described in the recoil post. It isn’t just the peak force, but the entire “area under the curve” when you graph force over time. 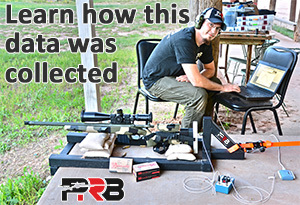 % Reduction in Peak Force – This is the highest instantaneous peak force recorded through the entire recoil event. To learn more about those measurements and hear the cases for both sides, please read the recoil post. For our mid-sized 30 caliber cartridge, I had to go with the legendary 308 Win. The rifle I used is not a precision rifle, but it represents something most people are familiar with. It is a standard, budget-friendly 308 rifle. This particular one is a Savage Axis SR 308 Win. I consider it my baseline for comparison. While not all of my readers have had the pleasure to shoot a really high-end precision rifle (like the other 3 test rifles), almost everyone has fired a rifle similar to this. So by using this rifle in the tests, it can help give some context for the amount of recoil we’re talking about. 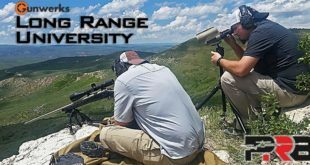 This rifle may also help us understand how the rifle weight plays into the recoil equation, and how that affects muzzle brake performance as a percentage of recoil reduction. 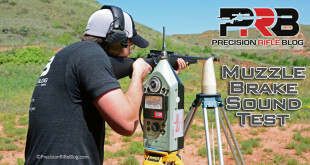 Just as we saw in the recoil results for the 6mm and 6.5mm, both American Precision Arms and Alamo Four Star have a measurable lead over the rest of the pack. 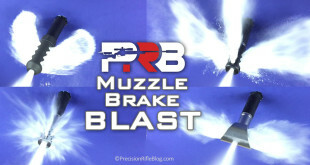 This time though, the American Precision Arms brake is the larger Fat B* model, and not their Little B*. The Fat B* was originally designed for big magnums like the 338 Lapua, but they also offer it in 7mm and 30 caliber versions … so I included it in the 308 Win tests. It looked oversized on this rifle, but it was clearly effective. The new Alamo Four Star Cowl Induction Muzzle Brake was right there with it though, with virtually identical performance. Behind those two muzzle brakes, were a big cluster of muzzle brakes that in the range of 27-37% recoil reduction. Both the 6mm and 6.5mm brakes had a similar cluster from 26-36%. That is interesting, considering there are many different designs represented in that cluster. 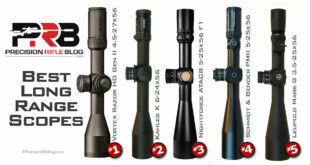 Leading that group is the Holland Radial Muzzle Brake, JP Recoil Eliminator, Center Shot Rifle’s Blast Tamer (note their large 4-port model was used for the 30 caliber rifles), American Precision Arms (APA) Little B*, JP Large Compensator, new West Texas Ordnance Muzzle Brake, and the new Impact Precision Muzzle Brake. I also wanted to draw attention to the Badger FTE Muzzle Brake, because this is the one rifle I was actually able to test the recoil on. While most muzzle brakes simply screw on the threaded part of the muzzle, the Badger FTE brakes screw on and clamp onto the barrel. For the barrel clamp to fit, the muzzle of the barrel must be very specific dimensions, which often means you need to pay a gunsmith to contour to it to those dimensions. But, I’m glad it worked on this rifle, because that will let us gauge its effectiveness in terms of reducing recoil. You can see it finished around the middle of the pack, ranking 11th among the 17 brakes tested on the 308. 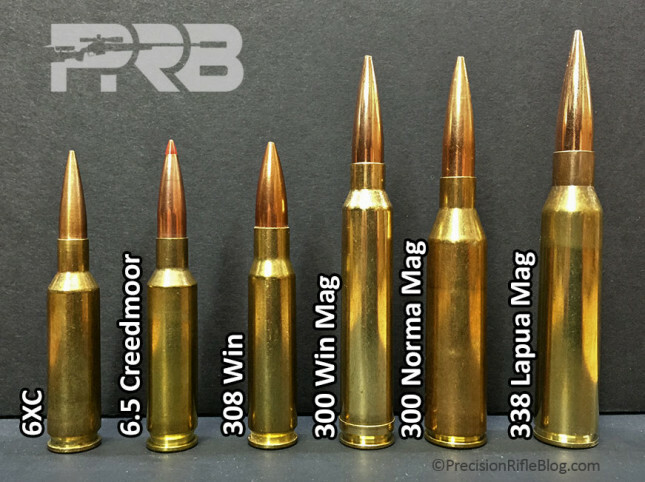 One big difference between the results for the 308 Win and the results for the 6XC and 6.5 Creedmoor was the difference between how much it was able to decrease the peak force compared to the overall momentum. On the 6XC, the reduction for the overall momentum (green line) and peak force (blue lines) were very similar, with the impulse being decreased by 2% more on average. For the 6.5 Creedmoor, they were still similar values, but they were reversed, with the peak force reduced 5% more on average than the momentum. But for this lightweight 308 Win, all the brakes were much more effective at reducing the peak force than they were at reducing the overall momentum. Peak force was reduced by 16% more on average than momentum. I want to point out this is just one suppressor design, and it isn’t representative of all suppressors. Many perform worse (especially if they’re shorter), and there may be a few that provide better performance. This isn’t a suppressor field test, but I just wanted to include one for comparison. Here is a different view of that same data. This scatter chart helps you see the cluster of brakes in the center, and the outliers on both sides of the spectrum. It also helps you separate the different types of recoil reduction, so you could place more weight on either overall momentum or peak force, if you thought one was more important than the other. Remember, I’m not trying to convince anyone one way or the other, I’m just trying to present the data I collected and leave it up to you to draw your own conclusions. On the 308, there was really just one straggler way behind the rest of the group: the OPS Accuracy Tuning Brake. As I mentioned in the last post, I’m clearly a research nerd, and when I built my first custom rifle, I put a lot of thought into every part. After reading a ton of forum threads, I bought an OPS brake for that rifle. I was excited to see how the empirical data stacked up to the hype I read online. I was obviously disappointed by the results. It just goes to show, you can’t believe everything you read online! 😉 This just reinforces the value of data-driven tests, over merely reading people’s opinions. While planning these tests, I put a lot of thought into what cartridges to test. I knew I wanted to focus on 6mm through 30 caliber. The 6mm and 6.5mm cartridges should obviously be representative of the most popular precision rifle cartridges in the Precision Rifle Series, since those are extremely popular calibers for those practical/tactical style competitions. For the 30 caliber, I knew I’d risk getting hate mail for years if I didn’t include the 308 Win. So many guys have precision rifles chambered in the 308. But what about a larger 30 caliber cartridge? I considered the 300 Win Mag, but decided to go a little bigger … the 300 Norma Magnum. The 300 Norma Magnum (not be confused with the old 308 Norma Mag), is the newest cartridge in our line-up. It was designed in 2012, about the same time as Berger’s release of the 230gr Hybrid bullet … and the two make a perfect pair. 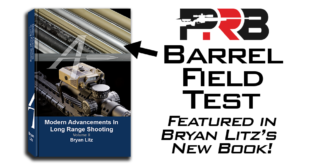 The ballistics of this cartridge can challenge the 338 Lapua Mag at long-range (see Todd Hodnett’s comparison). The 300 Norma Mag cartridge has 11% more powder capacity than the 300 Win Mag, and represents one of the largest 30 caliber magnums. So it is my bookend for the 30 caliber! While the 6XC, 6.5 Creedmoor, and 308 all have similar case capacity, the 300 Norma will help us understand what happens to muzzle brake performance when you significantly increase powder charge and bullet weight. 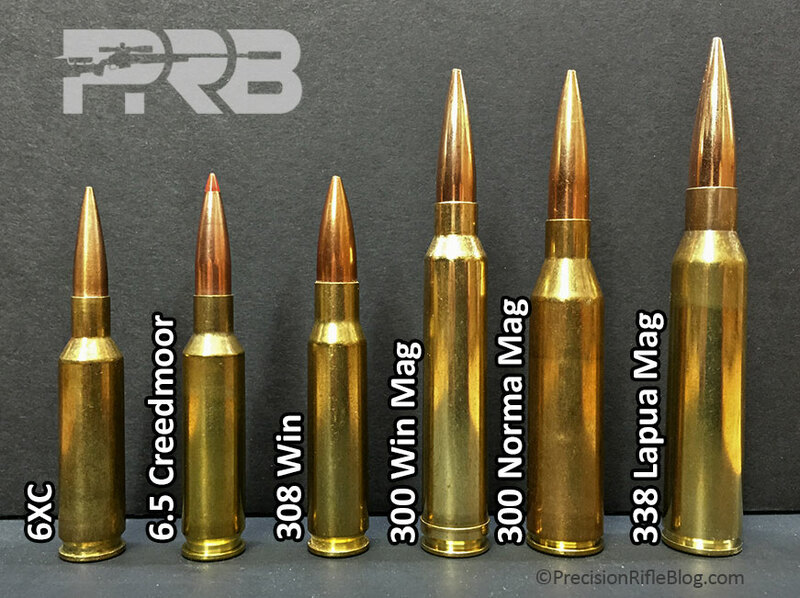 Here is a look at the cartridge capacities tested, along with a couple other popular rounds for context on the size of the 300 Norma. I didn’t run the 300 Norma Mag as hot as what I’ve heard rumors of other guys doing. Since the 300 Norma is so new, there isn’t much load data out there for it. I found some 300 Norma load data that appears to be from Berger, and loaded 82.0gr of H1000 to stay well within safe pressures. According to their data, that should be launching 230gr bullets around 2700 fps. 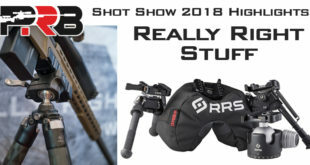 I’ve heard of guys pushing this cartridge up to 3000 fps using the 230gr Hybrids, but I have no idea if that is realistic and/or safe. Since I borrowed this rifle just for these tests (thanks Bob), I didn’t want to waste time doing load development, and I didn’t want to risk damaging the rifle or causing unnecessary barrel wear. The 300 Norma Mag test rifle featured a 27” Lilja Palma 30B contour barrel (similar to a Medium Palma contour). It weighed in at 15.7 pounds with a bare muzzle, and no bipod or magazine. That weight includes the scope and mount shown in the photo. And, once again … the Alamo Four Star and American Precision Arms muzzle brakes are out in front. This time the others are all more effective as well, with the majority running from 34-40% reduction in recoil. That means these muzzle brakes are doing a lot of work, considering the recoil a large magnum cartridge like this produces, especially running a heavy 230gr bullet. 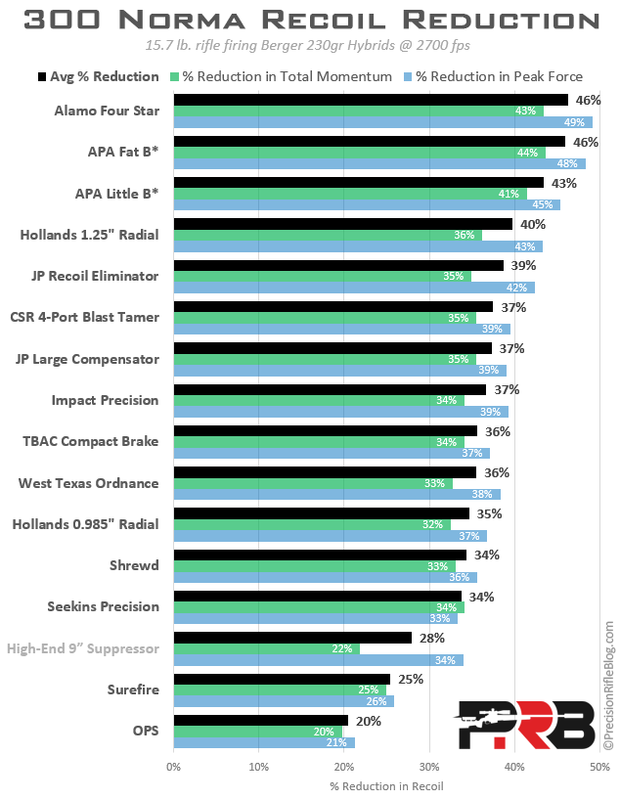 I included the new TBAC Ultra-9 Suppressor in these results as well. While the concussion of the blast was much more pleasant, you can see the suppressor just isn’t able to reduce recoil as effectively as some of these other brakes. And as normal, it does a better job of reducing the peak of the recoil than it does to reduce the total amount of momentum coming back at the shooter. Many suppressors (if not most) aren’t rated to handle something as big as the 300 Norma. In fact, Thunder Beast’s previous model, the 30P-1, wasn’t rated for the 300 Norma … but the new Ultra series of suppressors are rated up to a 300 RUM, which is 10% larger than our 300 Norma! The suppressor I tested still performed better than both the Surefire and OPS muzzle brakes … which are dragging up the rear. Both of those brakes had disappointing performance on the 300 Norma. Badger FTE Muzzle Brake – As I’ve explained before, the Badger barrel clamp design requires a very specific barrel diameter at the muzzle, and it didn’t fit on this rifle either. JEC Customs Recoil Reduction Muzzle Brake – I only had a JEC brake in 6mm to test. I couldn’t get other sizes for these tests. 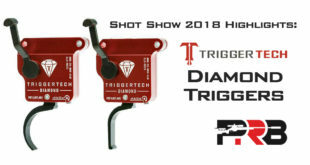 Tri Delta Muzzle Brake – Honestly … I just missed this one, and forgot to screw it on the day I ran through all the brakes on the 300 Norma. My bad. I did get it tested on all the other rifles. 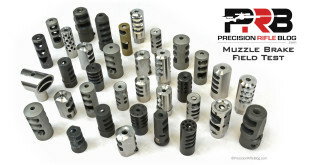 Tubb Precision Muzzle Brake – This brake is only available in 6mm. There are still A LOT of interesting results left to be published on this field test. Recoil was just one aspect of muzzle brake performance. Which ones help you stay on target? Which ones are 3-4 times as loud as others? Stay tuned! Want to be the first to know when the next set of results is posted? Sign-up to receive new posts via email. Field Test Overview & Line-Up: Overview of how the tests, what brakes were included, and which were caliber-specific. Recoil Reduction Results: Let’s get right to the meat! 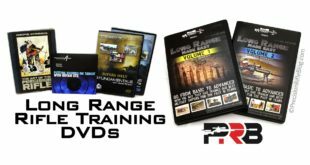 Recoil Primer, Test Equipment & Rifles: Explains how I tested, and what equipment and rifles were used. Results for 6XC and 6.5 Creedmoor: Recoil results for the mid-sized 6mm and 6.5mm rifles. 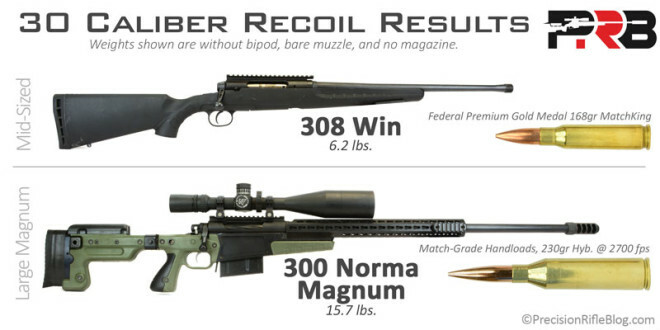 Results for 308 Win and 300 Norma Mag: Recoil results for the mid-sized 30 caliber and large magnum 300 rifles. 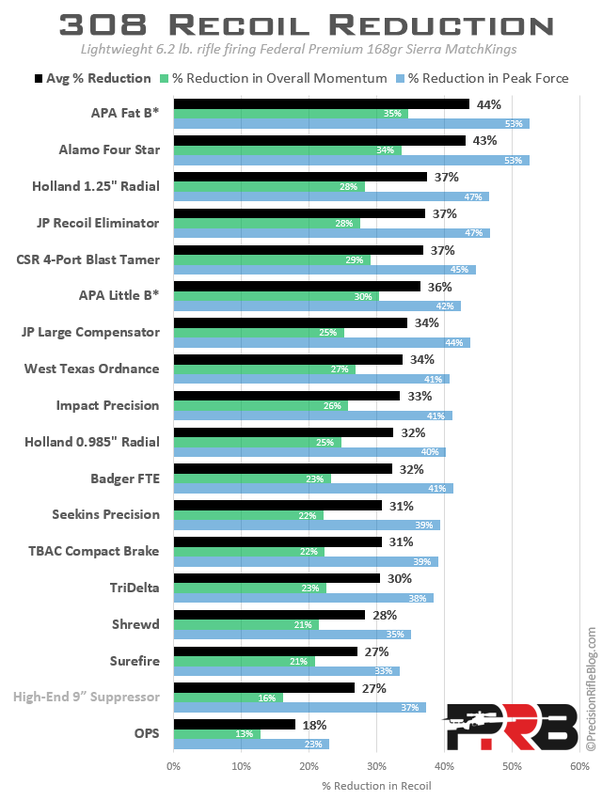 Summary: Overview of recoil results from all rifles, and overall ratings of each muzzle brake. Ability to Stay on Target: Lasers and high-speed cameras were used to objectively quantify how well each muzzle brake helps you stay on target through a shot. Sound Test: A high-end sound meter was used to measure how loud each brake was to the side of the rifle and at the shooter’s position behind the rifle. Muzzle Blast & Ground Signature: High-speed videos were shot of each brake to show the direction of the muzzle blast, and the impact that could have on the shooter. Overall Summary: Putting all the results together in a summary that is easy to take in, and do side-by-side comparison, allowing you to draw your own conclusions on what muzzle brake is best for your situation. Once again a BRILLIANT article! Thanks for your hard work and dedication. I really value your input from a more scientific point of view. I am in the final stages of getting a 300NM built and I asked my gunsmith to wait until we got the results back from your article. I am very glad I waited a while and you are helping me getting my dream gun built for ultra long range shooting. Without your input, many of us will feel lost in getting the right equipment. It will be like finding a needle in a haystack! Please keep up the good work and I know how hard it must be with two little kids running around that needs your attention too. I am about to have my 3rd! Hey, Vern. Thanks for the encouragement. I’m glad you’re finding the approach helpful. It seemed like there was a gap in the precision rifle world for an independent and data-driven approach, so I’m just trying to do what I can to help fill it! There is still a lot to be covered and I have a ton of ideas that I haven’t been able to get to. I hope this approach inspires others to join me on the journey, do their own tests, and publish it for everyone else to benefit from. I’d be tickled if that happened. I think it’d be healthy for the industry as well, and I know as consumers we’d all win. Great work as always. How woukd usage of a muzzle brake and suppressor (surefire) effect the outcome? Seems the suppressor woould cancel out the effect of the brake yet supposedely the brake improves the suppressor effect by operating as a 1st baffle. Read much that for dedicated suppressor use a brake is preferred. Thanks, George. That’s a great question. I didn’t test the Surefire suppressor, so I can’t say for sure. But, I did test the TBAC Compact Brake, which is the Thread-Over-Muzzle-Brake (TOMB) designed for the TBAC Ultra-9 Suppressor. So you can see how the muzzle brake performed with and without the suppressor attached. I didn’t do that on purpose, and actually only thought about it when you asked … but that is a cool, accidental comparison in the data. 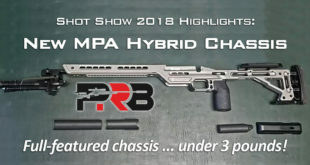 It looks like the brake was 4% more effective on the 308 and 8% more effective on the 300 Norma than when the suppressor was threaded onto the brake. And you’re right. A TOMB brake typically acts as the first baffle or two in the suppressor. They have a “symbiotic relationship” for lack of a better term. One manufacturer said someone slipped a cylinder around their muzzle brake, and was shocked at how effective of a suppressor it was. (Which I should point out is illegal in most places without the proper license.) That may be a gross over-simplification, but that is one way to think about a suppressor. It’s the same as a muzzle brake, in that there are baffles trying to redirect expanding gases … but the gas isn’t allowed to escape out the sides. The gas escaping out of the sides is part of what allows the brake to do work in our favor (i.e. baffles redirected gases to move to sides or even rearward, and during that collision “an equal and opposite” amount of momentum is applied to the baffles, pushing them away from the shooter and offsetting recoil). You can see the recoil post for more details on that phenomenon. So, although there are more baffles in a suppressor (9″ long instead of a 3″ long muzzle brake), they don’t take advantage of redirecting gas. Eventually all of the gas escapes along the path of the bullet, and none goes to the sides. It seems like when the gases initially strike the baffles they’d be doing work in your favor, and a suppressor also slows down those expanding gases which spreads out the recoil and a decrease in velocity also reduces momentum. 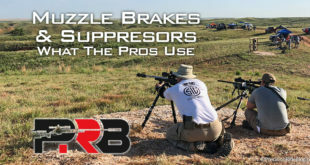 But, since suppressors aren’t able to redirect those explosive gases like a brake can … it seems they may always have a fundamental handicap when it comes to recoil reduction. Because of that design constraint, it might be surprising if there was ever a suppressor that could reduce recoil as well as a muzzle brake. Hope my ramblings answer your questions. I do appreciate the question, because I didn’t even realize I had published the data for a TOMB brake with and without the suppressor attached. That’s interesting data. Is there any reason to believe that (based on what we’ve seen so far) when choosing a brake for a .338LM, your best choice would not still be going with the Alamo or APA? Well, there are A TON of 338 brakes out there. That really gets you into a completely different product, which is why I just focused this test on 6mm through 30 caliber. There is some overlap (like the APA), but I believe Alamo is working on a completely different brake for a 338 and a completely different brake design for a 50 cal. I’m not positive about that, but that is the last I heard. It’d probably be a safe bet that those models would perform well on a 338. They’re obviously really effective designs. But, are they the best? That is yet to be seen. I’d be surprised if there wasn’t a challenger out there. I may end up testing 338 brakes at some point, but I don’t have it on the schedule for 2015. Thanks for such an unbiased write up !! I am looking for a brake to put on my DPMS .308 and you have helped to make my decision easy !! You bet, Joe. Glad I could help. Very comprehensive and informative post, being a your regular reader cant go with out leave a comment, thank you for your contribution. Thanks for the feedback! That helps me know I’m on the right track. I’m just trying to publish stuff that’s helpful to fellow shooters, so thanks for the taking the time to let me know it’s working for you! 2nd: I understand you are working with what you got, but I would love to see the addition of other brakes such as Lantac Dragon and Battlecomp. Perhaps you could inform the respective manufacturers about your unbiased comparison, and you could trade free marketing for free brakes for testing. Who knows! 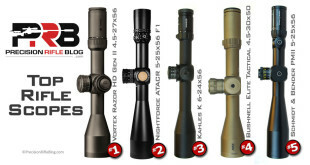 3rd: If you’re looking to do another comparison, you might want to consider either doing one specifically for flash hiders, a full comparison between all muzzle devices between sound, flash, and recoil, or something to that effect. I know people are interested, and it would be fantastic to see. Though I know that might be asking alot. 4th: You, sir, are a gentleman and a scholar. You need a donate button or something. Keep up the great work! Hey, William. Thanks for the encouragement. Good to know you found this helpful. At this point, I’m done testing brakes for at least another year. If/when I test another batch, I’ll likely let my readers vote on which ones are included. Those 2 aren’t used by any of the precision rifle shooters I know, but that doesn’t mean they aren’t good ones. I heard someone say “Don’t fix happy” … so if you’re happy with them, I wouldn’t change. There are just a billion brakes out there, so I couldn’t test them all. I appreciate the suggestion about flash hiders, but that isn’t really what I’m interested in. I’m not military, so I don’t have to worry about muzzle flash, and most of my readers are in the same camp. Some guys might find it interesting, but it may not be worth the effort it would take. Because I do all this in my spare time, I’m always trying to think whether something is worth the time I’d spend on it. I’d bet if flash was a major concern, most people would use a suppressor instead of a muzzle brake. And there is a donate button, but I just don’t push it. 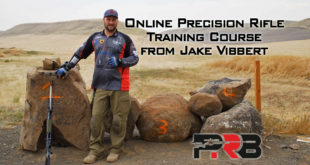 There are 2 ways you can support the website, and you can see those here: http://precisionrifleblog.com/support/. Thanks again for taking the time to let me know you found this helpful. That’s great to know. As always, I really appreciate your hard work! Kudos for maintaining a numbers-first approach to your analyses. I am considering to add a brake to my Remington 700 XCR Long Range 300 Win Mag — I presume that will require a specific thread pattern based on the brake I choose. 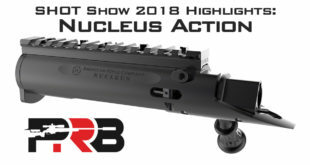 I want to preserve maximum optionality down the road to add a suppressor to my rig (I believe it should be as simple as screw-off-the-brake-screw-on-the-suppressor and adjust zero). (1) Am I correct in my screw-off-screw-on assumption? (2) How best to slice the universe of available brakes based on thread patters and do the same with suppressors so that I can research and decide on a brake/suppressor pairing? Hey, Jon. You’re absolutely correct. 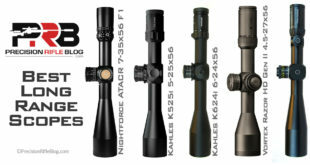 For 6mm through 30 caliber, the 5/8×24 thread pattern is by far the most popular and very interoperable. So if you have a muzzle brake with that thread and a suppressor with that thread, it just takes about a minute to switch the two. As long as you stick with 5/8×24 thread on both of them, then it shouldn’t matter which one you purchase. I personally like the American Precision Arms Little B* or even Fat B* for a 300 Win Mag. The Alamo Four Star would also be a good choice. And I personally think Thunder Beast (TBAC) suppressors are the best that money can buy. The POI shift is minimal and 100% repeatable. In my experience the TBAC suppressors definitely don’t have a negative impact on precision (which some suppressors do), and could improve it slightly. That statement probably deserves a little explanation, because I know I’d throw up the BS flag if I heard that not too long ago. The potential for precision improvement is really 3 part: 1) I shoot better with the reduced concussion and reduced recoil, 2) The turbulence the bullet experiences in that brief period of “transitional ballistics” is reduced by the suppressor diverting some gas, and 3) adding weight to the end of the barrel can dampen barrel harmonics and may make those more consistent shot to shot. Some of these are also true to some extent with a muzzle brake. 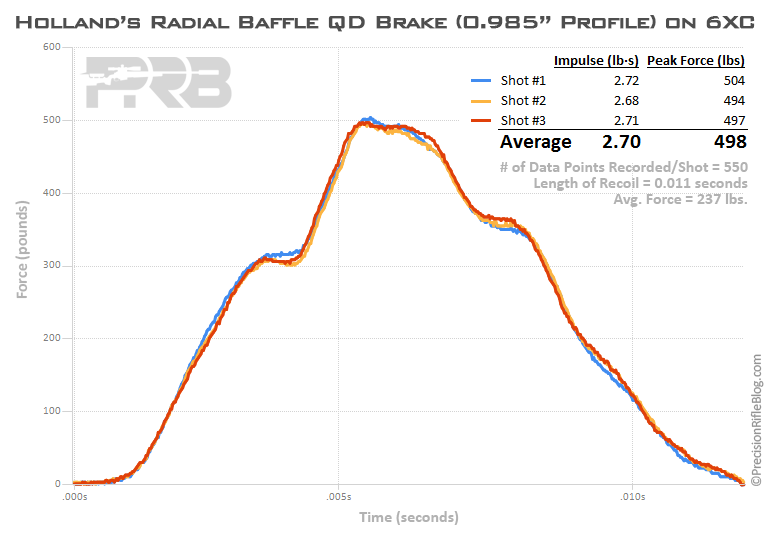 And the muzzle brake clearly does better at reducing recoil … as I measured in this study. Ultimately as long as you thread to a standard pattern (5/8×24) and buy a brake and a suppressor that are threaded to that … you’re golden. Should be easy. I switch back and forth all the time. If the brakes from Lantac and Precision Arms came into place to perform for 308 cal, how would you guess they will place them self in the ranking wise? Thanks! It was a lot of work, but the results are pretty interesting. I learned a lot, and hopefully it helps manufacturers understand what designs are most effective. Ultimately, when the consumer is educated and armed with good info, products just seem to get better. It’s almost like magic!